Here is a fun way to view nursery rhymes in your classroom using Nursery Rhyme Juke Box! Nursery rhymes are a powerful way to develop many skills including: fluency and oral language, phonological awareness, comprehension, speaking and listening, and keys ideas and details. together. Continue saying letting children choose rhymes. Here is a link to get a Freebie File with 4 Nursery Rhyme CDs! day to be your child’s companion in learning. wonderful year as we learn and grow together! I like to come to school. *Let children make up additional verses for the above song about what they like best at school. *Make a language experience chart with each child's name and why they like to come to school. Ask each child to draw a picture of what they like best. (For younger children, photograph them in their favorite area of the classroom.) Put their pictures together to make a book called “We Like School.” Read it each morning to create positive feelings about school. 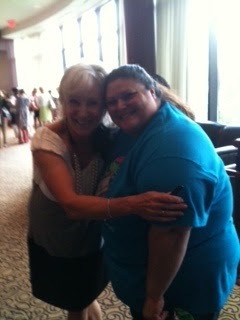 The SPLASH Conference in Houston this week was a blast! It was so exciting to put a face with a name! Kristina Parr has shared lots of PPTs she created to go with my songs and I finally got to meet her and give her a hug of thanks! It’s Friday. It’s Friday. It’s really, really Friday. Because it’s Friday. It’s Friday. It’s really, really Friday. *You can insert any day, but Friday is the best! Hiding away so that nobody sees. Soon they will come creeping out of their hive. If you’re starting to worry about getting your room decorated for the first day of school have I got a great idea for you!!!! Wrap yellow caution tape around your door and post a sign that says “Under Construction.” Explain to the parents that you are trying to develop a classroom community and you want your students to decorate their own learning environment. Invite parents to come back at the end of the week to see what their children have created! 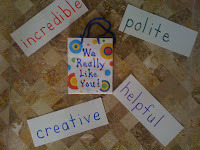 Here are some great projects that will help children get to know each other as they make their classroom reflect them. board or tape to a cubby. Children can display their own work by slipping drawings, stories, etc. in the pocket. Hint! You can also use a clear sheet protector to display children’s work. collage materials, etc. Punch holes in the corner of each square and tie together with yarn to make a quilt to display in the classroom or hallway. 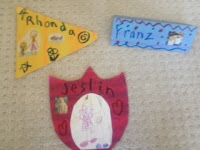 Use construction to let children create banners or pennants that reflect them. They might include hobbies, favorite foods, pets, family members, goals, etc. Oh, what a happy day! Don’t you just LOVE the Olympics! It’s a time when everyone in our country can cheer on the same side. Besides, there hasn’t been too much worth watching on television this summer so there won’t be any channel surfing for the next two weeks. How about some pompoms to cheer on the red, white and blue? release wiggles, and reinforce skills with the activities below. Hint! 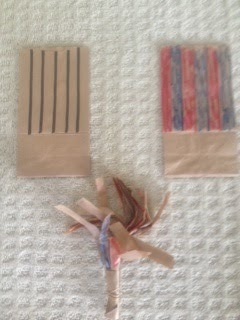 Children can also paint bags or decorate with team colors. Cheer” and other letter chants and songs. backwards and spelling out words. Syllables – Clap out syllables in words using pompoms. together and say the compound word. such as “sat.” Take away the /s/ and put an /h/ there. Patterns – Clap out math patterns and have children repeat or extend. Skip Counting – March and shake pompoms as you skip count. motions with their partner using their pompoms. Directions – Have children follow directions with their pompoms. Can you put them on your head? Can you put them behind you? Can you put one on your shoulder and one on your knee? 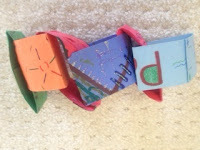 Name Puzzle – Write the child’s name on a 10” sentence strip with a marker. Cut between the letters in the name and put them in an envelope. 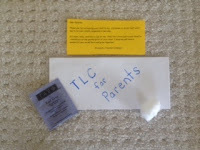 Write the child’s name on the front of the envelope. Children take the individual letters from inside the envelope and put them together like a puzzle to spell the name. 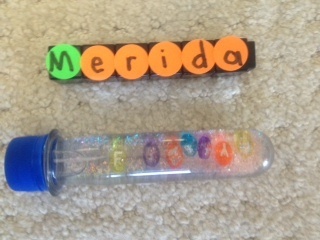 Name Bottle – Place letter beads that spell the child’s first name in an empty plastic water bottle. Challenge children to find the letters in the bottle and spell the name. *Hint! Add water and glitter to the bottle if you desire. Unifix Cubes – Use sticker dots to write children’s names on Unifix cubes. Make the first letter a different color. 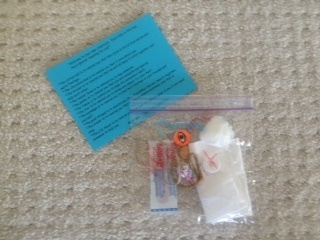 Place these in a center with a list of friends’ names so they can take them apart and put them back together. P.S. I saw BRAVE and loved it! I think Merida is my new favorite name. And I’ll tell you the same. your students get to know each other as you create your classroom community. Child’s name, child’s name, sick in bed. Called the doctor and the doctor said. Come on, child’s name, you’re not sick. All you need is an exercise trick. So stand up and shakey, shakey shakey. …Continue around the room chanting to each child. Where, oh, where is our friend, child’s name. There he/she is wearing color child has on today. …Continue singing each child’s name and the color they are wearing. School Friends – Let each child fill out a page similar to the one shown with their name, age, favorite color, favorite book, pet, and other personal information. Add a photo and put their pictures together to make a class book. (Make sure the teacher adds a page, too!) Let one child take home the book each day to introduce school friends to their families. Autograph Book – Make blank books by stapling several sheets of colored paper together. Let children go around and get their friends autographs. Graphs – Get to know each other and develop math skills by creating class graphs. You might make a graph of how children get to school, the number of brothers and sisters they have, pets, favorite pizza topping, and so forth. Echo Song Echo Song - The teacher sings the first line and the children answer singing the second line. “Where Is Thumbkin?” is the tune. Continue singing other questions about eye color, pets, siblings, likes, hobbies, etc. Teachers often ask me if I enjoy traveling. NO! Flying, waiting in airports (aka Airport Appreciation Time), noisy hotel rooms, security lines…NO FUN! However, when I get to share with a group of teachers it is pure JOY! It makes my heart sing when you smile and get excited about a new idea! Thank you for making this 65 year old woman feel like she still has something to offer teachers and children! Besides, YOU always energize me with some great new ideas! Look what I brought home with me this week from Mobile, Houston, and Huntsville, AL. Kat Baxter has a jar called the “Snaps” jar. When the kids do something that they are proud of they write it on a strip of paper and place it in the jar. 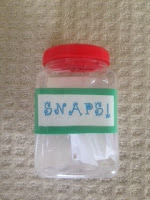 The teacher pulls their names from the jar and the class gives them “snaps” to celebrate. Teach children the “hotdog” clap by extending your arms wide horizontally and clapping. For a “hamburger” clap extend your hands vertically. Check out filefolderfun.com for FREE file folder games. Here’s something fun to make for your door to welcome the students. Lay on a large sheet of butcher paper and ask a friend to trace around your body. (You’ve probably done this to your children before.) Color yourself and cut yourself out. (Go ahead and take off a few inches. You can body sculpt all you want!) Tape this on the door and then make the following labels and attach them to the different body parts. You know all of those drawings and love notes you receive every year. Here's a way to save them and show the children that you value what they give you. All you have to do is get an old three ring notebook and make a cover with your picture and the year. When a child gives you something you can date it, hole punch it, and put it in the notebook. Keep it in your classroom library so children can revisit it. *One teacher saves these through the years because the children enjoy looking at what other classes have done. IT LOOKS LIKE I’M PLAYING BUT…. 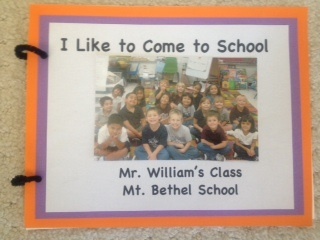 Make a book by taking pictures of your students engaged in different centers. Use the following captions to describe the benefits of each area. Let one child take home the book each day to share with their families. Math - It looks like I’m playing, but I’m developing oral language,; social skills, small motor skills, concepts about quantity, shape, size, pattern, and an interest in math. I may use these tools as a computer programmer, accountant, or mathematician in the future. Table Toys - It looks like I’m playing, but I’m developing small muscles, eye-hand coordination, attention span, social skills, and concepts about size, shape, color pattern. I might use these skills as a chef or dentist one day. Language – It looks like I’m playing, but I’m developing oral language, alphabet knowledge, print connections, phonological awareness, visual skills, book knowledge, phonics; motivation to read. No matter what I become when I grow it, it will be important to know how to read. Portfolio – Individualize children’s growth by collecting samples of their work each month and saving the work samples in a portfolio. You can use grocery sacks or clasp envelopes and date each month. Collect a writing sample, self-portrait, small motor activity, math page, etc. You could bind these together and present them to parents at your end of year conference. Notebook – Put a divider with each child’s name in a three-ring notebook. Place a copy of the skills checklist for each child behind their divider. Also, put a clear sheet protector for storing samples of their work and anecdotal notes. Simplify record keeping by having this handy when you work with individual students or small groups. Four Square Assessment – At the beginning of each month, have children fold a piece of paper into fourths. Ask them to write/draw the same thing in each square every month. You might have them draw a picture of themselves, write their name, write letters of the alphabet, numbers, shapes, write a story, etc. Adapt to your age level and standards. Date and save for a “reliable” picture of the child’s progress throughout the year. I want to work on _____. My favorite book is _____. Hint! Younger children could just dictate their responses to an adult. Child’s name ate the cookie in the cookie jar. (Choose a second child’s name) in the cookie jar. Glue each child's picture to the back of the cookie. 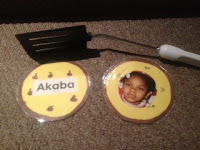 Place on the floor and give children a spatula. They can take turns reading names and flipping the cookies over. Give each child a cookie to eat for snack. Take a picture of them eating their cookie, and then make a book with their pictures. Write, "Who ate the cookie from the cookie jar?" at the top of the page. Write "(Child's name) ate the cookie from the cookie jar. Let one child take the book home each evening to share with their families. Younger children will enjoy a "Friend Phone Book." Take a picture of each child and glue it on a sheet of paper. Have them write their name at the top and their phone number at the bottom. (You may need to do this for younger children.) Tear the front and back off your local phone book to make a cover. Glue a title that says “Mr./Ms. Name Class Directory” on the front. Use in the dramatic play center by a play phone or place in the math center with an old cell phone. Want to impress your parents the first few weeks of school? Use your computer to help each child design a personal business card. Include the child’s name, school, teacher’s name, and a graphic of their choice. Print on cardstock (you can get about 10 on a page) cut apart, and have children distribute them to family members, neighbors, and friends. A “Hello Book” is perfect for helping children recognize their names and create friendships. You will need a photograph of each child, construction paper, book rings, and markers. Glue each child’s photo on a page. (If you don’t have photographs of the children, just let them draw a picture of themselves.) Write “Hello child’s name.” at the top of the page. Punch holes in the pages and put together with book rings. Start your day by reading the book together and saying hello to each other. *You could also use the book when you want to ask questions to the class. Randomly turn to a page and let that child answer the question. This will allow “thinking time” and discourage children from shouting out the answer. *Use this book to dismiss children for learning centers, to line up, etc. Flip through the book and hold up different pictures. As the children see their photo, they may be dismissed. Hint! Bind the pages at the bottom so you can hold the book in your lap and flip down the pages as you sing. *Make a similar book called "Kiss Your Brain!" Or, how about, “Got Milk?” where you paint a white mustache on each child’s photo with white out! My friend Vanessa Levin (pre-kpages.com) made this book for me years ago. I LOVE RED, WHITE, AND BLUE! HAPPY EVERYTHING FROM A TO Z!